How do I retrieve texts deleted in error from iPhone? 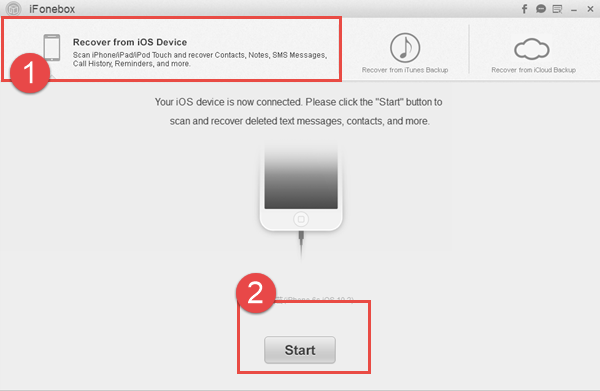 How to retrieve texts deleted in error from iPhone? How to get them back? This article will help you to recover deleted texts in error on iPhone. As I only have the iPhone 5c 8 GB, I was removing old texts & must have put a tick in the delete all box & lost my texts for one conversation. Can someone please let me know how I can get them back as there are some I really need to keep? iPhone 5c, iOS 9.1.
he above content was extracted from Apple community and obviously, this user had difficulty in retrieving texts deleted in error from his iPhone 5c. So have you got any method to help him get back iPhone lost text messages? Actually, this is just as easy as a piece of cake. Just follow. But before retrieve texts deleted in error from your iPhone, you need to realize that once you find some messages were deleted accidentally, go to turn on Airplane Mode juts in case of the deleted messages being overwritten by new data. Then, if permitted, you can make a backup for your iPhone. 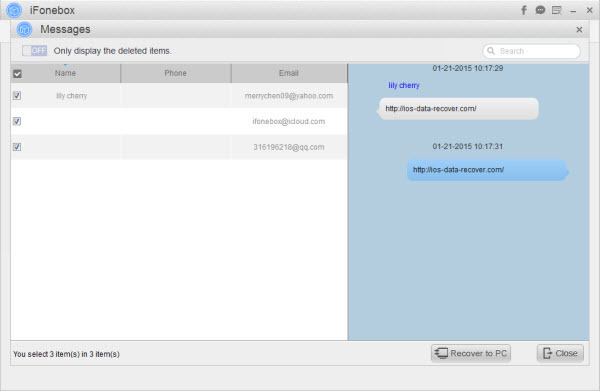 Next, use iFonebox to get back those accidentally deleted messages from your iPhone. As is known that iFonebox is a powerful iOS data recovery software which can not only recover deleted data like messages, contacts, notes, WeChat messages, etc, from iPhone, iPad and iPod Touch, but access and restore data like photos from your iTunes or iCloud backup selectively, without wiping any data from your iPhone. Quite professional. It is necessary to download and install iFonebox firstly. There are two versions accessible: Windows version and Mac version. How to retrieve texts deleted in error from iPhone? After installation of iFonebox. you can do as the following simple steps. Take iFonebox for Windows as example here. Start iFonebox. Choose Recover from iOS Device mode. Remember to plug in iPhone to the computer with USB cable so as to scan and recover lost messages from it. Just Click Start button to begin. Scan messages from your iPhone. Now you can click Messages item to begin the scanning and analysis process. Preview and select deleted messages to recover. Now you have the chance to select those texts deleted in error and then, click Recover to PC button to retrieve all deleted text messages. Tips: if you have an iTunes or iCloud backup for your lost text messages, you can also choose Recover from iTunes Backup or Recover from iCloud Backup to retrieve those deleted texts by mistake.